Does a Halfway Breakup Go Far Enough? Dover Corp. is slimming down, but it’s still a conglomerate. 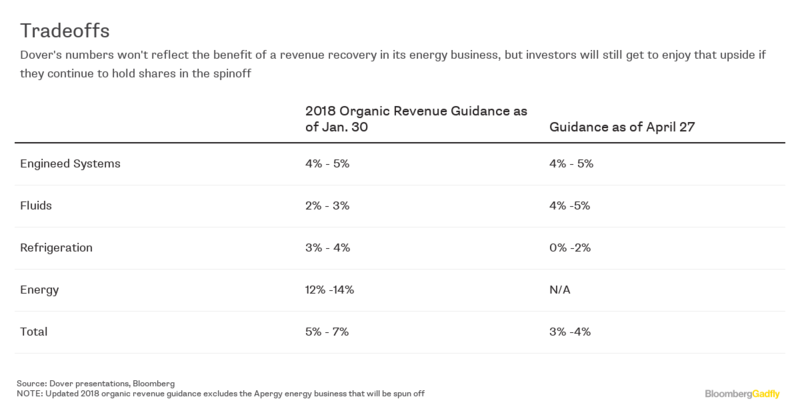 The industrial company on Friday for the first time gave 2018 guidance excluding the Apergy energy business it plans to spin off next month. Dover expects adjusted earnings per share of $4.70 to $4.85 this year, with the midpoint of that range in line with Robert W. Baird & Co. analyst Mircea Dobre’s back-of-the-envelope estimate. Dover increased its organic revenue outlook for its fluids unit, which sells gas-station fuel pumps and systems that make pellets for the pharmaceutical industry. But the company said sales for its refrigeration and food-equipment segment may end up flat relative to last year, excluding the impact of currency swings and M&A, compared with a previous call for growth of as much as 4 percent. The lowered outlook for refrigeration stands out because some analysts had viewed Dover’s initial guidance, released only in late January, as too aggressive given weak bookings trends in the retail market and tough comparisons. The updated forecast is more in line with their expectations and some of management’s qualitative commentary. Such short-lived optimism on the company’s part is a bit weird. But the broader point here is that even after Dover completes its breakup, it’s still comprised of disparate businesses that won’t always be growing in lock step. Refrigeration tends to be a lot less volatile than sales of energy equipment, so Dover’s overall goal of stabilizing its profitability and limiting the impact one division could have on the company as a whole is still intact. RBC analyst Deane Dray has estimated that Dover would have seen only a 1 percent decline in its operating profit during the oil and gas downturn from 2014 to 2016 if it didn’t have the energy unit. As it was, earnings declined more than 30 percent from peak to trough, he says. 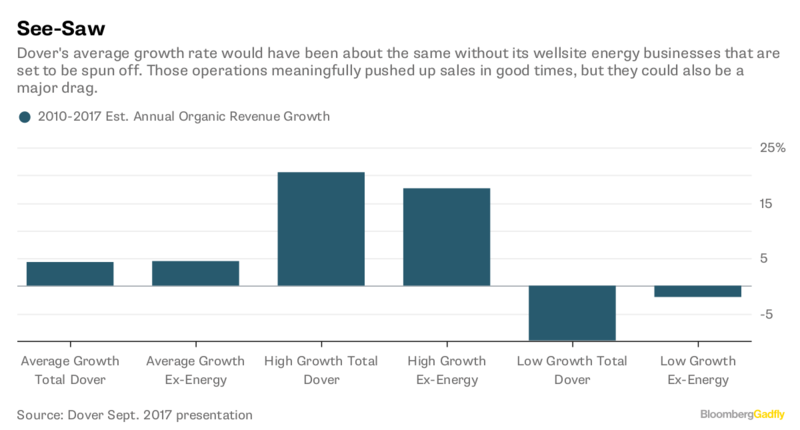 Similarly, Dover has said its average organic growth rate between 2010 and 2017 would have been about the same with or without the energy business; it just wouldn’t have jumped around quite as much in the interim. Dover’s average growth rate would have been about the same without its wellsite energy businesses that are set to be spun off. Those operations meaningfully pushed up sales in good times, but they could also be a major drag. But the tapered outlook for refrigeration poses an interesting question about industrial splits at a time when so many companies are pursuing them. Do halfway breakups of big conglomerates work as well as a clean division at a company with two distinct businesses? Arguably, they simply refocus attention on other problem units. If you are going from a diverse conglomerate to a relatively less-diverse conglomerate, there’s still going to be a degree of puts and takes to your earnings. Refrigeration, for example, was the least profitable of Dover’s remaining divisions last year, and that trend held in the first quarter. Some diversification isn’t a bad thing as a downturn in one business may be offset by growth in another. But in practice, investors have cast an irritated eye toward lingering drags on company’s earnings after a breakup. General Electric Co. has gotten rid of tons of businesses, and it’s still too big and diverse for investors’ liking. Danaher Corp. spun off its Fortive Corp. industrial business in 2016 as it narrowed its focus to life sciences and water quality. But it held on to a dental unit, which has been a real toothache for Danaher’s organic growth. exploring options for its battery unit, which remained at the company following a spinoff of its Adient Plc automotive business and merger with Tyco International. Parting ways with the power-solutions division may help Johnson Controls get the kind of free-cash-flow profile and higher multiple it was aiming for with those strategic maneuvers, although it still has plenty of work to do to boost margins at its main building efficiency products unit. It’s enough to make you wonder whether this time next year we’ll be talking about a separation of Dover’s refrigeration equipment business, and what the ultimate end game is for all of this industrial breakup fever.